Waleran’s origins are something of a mystery. The first record of him, and of Albreda, is not connected with Fenne or Scrane or Lincolnshire at all. It is connected with a small village just southeast of Nottingham called Clipston on the Wolds. It dates from 1 August 1198, when Matilda de Badlesmere and her attorney, William de Badlesmere, granted the couple and their heirs “seven parts of a sixth part of a knight’s fee in Clipston to hold of Matilda and her heirs for forty shillings”. Waleran and Albreda’s heirs would continue to have several hundred acres of property in this village until at least 1262, and it is likely that the couple already had some connection to that place or the Badlesmeres, but there is no evidence to tell us what. Over the course of their lives, however, Waleran and Albreda would have far more to do with Lincolnshire and the properties she inherited from her father around Fenne and Scrane, than with Clipston. In summer 1199 the couple were drawn into two major rows over her inheritance that would see them repeatedly in court over the next three years. The first of these was with three sisters – Ismenia of Whaplode the widow of William the Angevin, Cecilia the wife of Henry Portarius of Salisbury, and Isabella the wife of Baldric de Grendale – and was about some 75 acres of property in Skirbeck and Benington that was held under the honour of Richmond. First Waleran sued the three sisters, presumably on Albreda’s behalf, for taking possession of the property after the death of a (possibly shared) ancestor. That was in June 1199. In October Cecilia and Isabella appointed Ismenia as their attorney to counter-sue. In 1202, after at least four or five court dates, a settlement was finally reached. Waleran and Albreda enfeoffed the three sisters at the disputed property in return for three parcels of land: one in Skirbeck that the sisters held under Ralph son of Stephen, another in Fenne that they held under the Huntingfields, and two messuages (essentially halls with plots of land) in Boston that they held under the honour of Richmond. While the first two parcels were relatively small – about fifteen and seven acres respectively – the two plots in the booming market of Boston were prime property. Waleran and Albreda’s second inheritance battle in the summer of 1199 was with the nuns of Stainfield over the rights in the church of Quadring that her father Ralph had granted them fourteen years earlier. The parson, Albreda’s uncle John, had died, and to the couple’s dismay the nuns had appointed a new parson of their own choosing, Gerard of Rowell. Late the next year Waleran and Albreda’s lawyer, Peter of Paris, took the matter to the Curia Regis, the king’s court. The prioress failed to appear, however, and the court sent instructions to the sheriff of Lincolnshire to take the church into the crown’s hands. Then there was some debate over whether the prioress had correctly appointed her lawyer, who was to be Richard the prior. But at length, around Easter 1201, the case was heard at Westminster. Peter of Paris argued that, just as Ralph had chosen the last parson, so it was Waleran and Albreda’s right to choose the next. But Richard the canon (presumably of Lincoln) turned up with two charters, one from Ralph himself and the other from Hugh, the late bishop of Lincoln. These proved that Ralph had granted the nuns the right to the choose the parson of Quadring forevermore, as long as they first let his brother John see out his days in the role with a pension of one talent a year. Peter of Paris complained that Ralph had been unwell at the time, so the grant was invalid, but the canon retorted that Waleran and Albreda themselves had been present when the grant was made, and they had not queried it at the time. The couple could not deny this, and the case was closed: the nuns won the day. So Waleran and Albreda were evidently married, or at least betrothed, before her father died, which was in 1190 at the latest. And although young marriages were not uncommon at the time, at least one of them was probably of age by that year. Otherwise Peter of Paris could have responded in court that they were both only minors when they witnessed her sick father’s grant to Stainfield. This points to a date of birth of around 1170, if not earlier. There is no evidence of a Rochford family anywhere near Fenne, Boston, Quadring or Clipston before Waleran married Albreda. Their new property at Clipston looks to have been part of a marriage deal, but otherwise everything they had, and every place they were associated with throughout their lives, was her inheritance. Waleran appears to have been some well-to-do family’s landless younger son who, having landed a rather smart match to a wealthy heiress, relocated to her homelands where he would one day become lord. He must have been a complete stranger when he first arrived in Fenne. There are no records that tell us where Waleran came from but there is plenty of circumstantial evidence to go on, and this gives us few clues about who his family might have been too. The earliest known record of a Rochford in England dates from 1146-1149. It is a charter from the Norfolk lord John de Cheney granting some property at East and West Rudham to a priory that his uncle had founded there. Cheney declared that his gift was “for the soul of my grandfather Ralph de Cheney and his wife, and the soul of my father and my mother, and William de Cheney my uncle, and Roger and their sisters, and Waleran de Rochefford, and all my forebears…” This Waleran must have been an uncle or some other close relative of John de Cheney, and he probably lived in the early 1100s, possibly even around the time of Domesday. These dates are far too early for him to have been Albreda’s husband, but he might well have been her husband’s ancestor. This older Waleran probably came from the town (or village, as it was then) of Rochford in the south of Essex. A prominent family known after the village was well established here by the mid-1100s, and they were of fairly high status in the county. They had two knight’s fees at Rochford itself, and another at Berden in the northwest of the county. They were vassals of the hereditary Constable of England, Henry of Essex, until he lost a trial by combat and disappeared into a monastery in 1163. 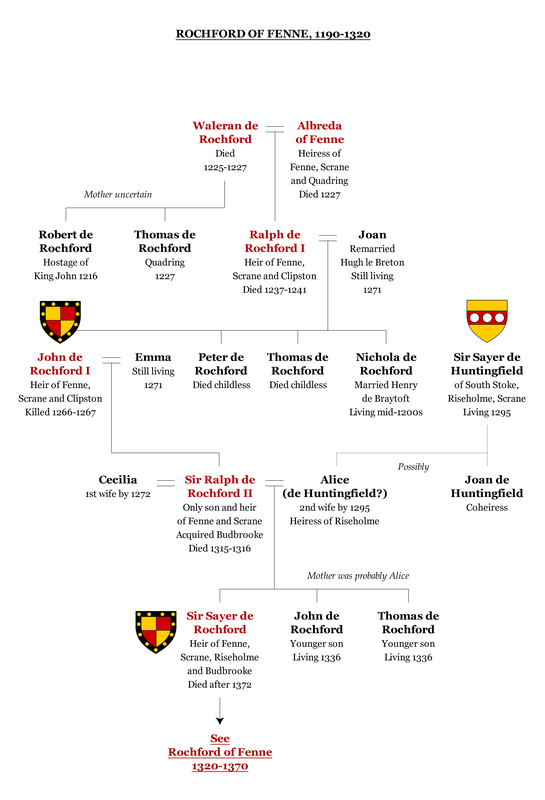 The earliest certain ancestor of this family was Guy de Rochford, who was head of the family in Henry of Essex’s time. The older Waleran was probably his father, grandfather or uncle. Around 1162-1164 Guy witnessed a charter for the earl of Buckingham, Walter Giffard, to Nutley Priory, and a few years later he was in possession of three knight’s fees as Giffard’s vassal. In 1177 Guy was fined ten marks by the crown for some infraction of the forest law in Essex, and in April that year he witnessed a charter for John de Cheney’s son-in-law Geoffrey de Say granting the church of Elsenham in Essex to Walden Abbey. Guy died around 1182-1183. His eldest son, who was also called Guy, was required to pay the exchequer forty marks to secure his late father’s lands, but only after the crown had made a quick £16 selling off his chattels. Within a few years, in 1185 at the latest, the younger Guy died too and his own eldest son John, who was still only sixteen years old, became a ward of the crown. The records of this note that John also had a younger brother aged twelve, and a sister aged fourteen, but neither of their names are given. In the 1190s John came of age, received his inheritance and became active in local affairs. His heirs still held the family property at Rochford and Berden in the 1340s, when Sir Thomas de Rochford was the last male heir of the line. But it is not known what happened to John’s younger brother and sister after 1185. The arms of the Rochfords of Fenne (top) with those of various members of the Essex Rochford family. There is no direct evidence of Waleran de Rochford’s origins, but his arms suggest that he was a member of the Essex family. There is compelling evidence that Albreda’s husband was related to this family. 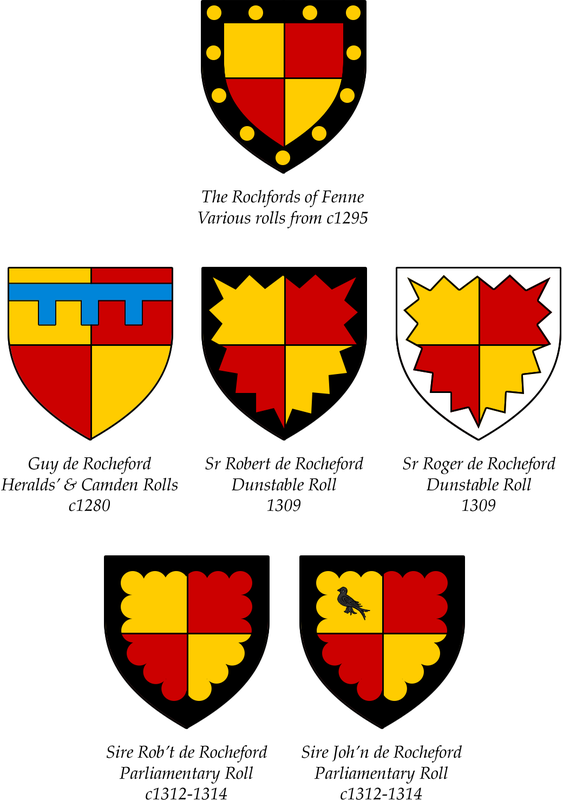 When the couple’s great-grandson Sir Ralph de Rochford’s arms were featured in several heraldic rolls in the late 1200s, they were remarkably similar to the arms of the Essex family. The Essex Rochfords’ coat was Quarterly or and gules – quarters of gold and red – usually with a border or a label of some kind. Ralph’s coat, used by all the Rochfords of Fenne after him, was Quarterly or and gules, a border sable bezanty – quarters of gold and red within a black border with gold coins on it. Another heraldic roll, the Parliamentary Roll of the early 1300s, featured the arms of about a thousand knights and esquires of the time, county by county. Here Ralph’s arms appeared not under the heading for Lincolnshire or Warwickshire, where his estates were, but under Essex, right beside the arms of two known members of the Essex clan: Sir Robert and Sir John. The scribe who prepared this manuscript clearly believed they were related. If correct, this can only have been through Ralph’s great-grandfather Waleran, who was Albreda’s husband. One obvious possibility is that Waleran was John de Rochford’s unnamed younger brother who was twelve in 1185. The dates and the context match well: he would have been born around 1172-1173, he would have inherited no land, and yet given his family’s status he must have hoped for his guardian to arrange a decent match for him in marriage. The heiress Albreda of Fenne would have been perfect. But there are other possibilities. While the two Guys were still alive, another Rochford family sprang up in Yorkshire with extensive estates at Wold Newton – the village was once called Newton Rochford after them. The earliest known member of this family, Simon de Rochford, was established in Yorkshire by 1175-1176 when he owed the crown five marks. In fact, he was probably already there by 1150-1157 when a Simon de Rochford witnessed a charter for William de Vescy to Watton Priory in Yorkshire. Simon himself gave property at Wold Newton to Bardney Abbey in Yorkshire, at Saltby in Leicestershire to Vaudey Abbey in Lincolnshire, and at Shoebury in Essex to Clerkenwell Priory by London. He died between 1187 and 1192, and he was followed as lord of Wold Newton by his eldest son, William. This family looks to have been related to the Essex Rochfords, and the dates suggest that Simon was a younger brother of one of the two Guys. As well as their lands at Wold Newton, Simon’s heirs had property in Essex at Shoebury near Rochford, and at Manuden near Berden. They were active in local affairs in both counties and they sometimes carried out business with the Essex Rochfords. For example, in the late 1100s or early 1200s John de Rochford of Essex granted some property at Berden to the convent of St Radegund in Cambridge, where his daughter Beatrice was buried. Among the witnesses to his charter were William de Rochford, Geoffrey de Rochford and Eustace de Rochford. One of these three might have been John’s younger brother. The other two, if not all three, were presumably cousins, and it is likely that this William was the same person as Simon de Rochford’s heir in 1192. It is possible that Albreda of Fenne’s husband was William’s younger brother. The Yorkshire Rochfords were especially fond of the name Waleran. William’s own son and heir in the 1230s was called Waleran de Rochford. He was followed in the 1250s by his son Eustace, who was himself succeeded by 1285 by a son Sir Walram de Rochford. The last of these, or perhaps yet another Sir Walram, was the last male of heir of this line – his only surviving child, Joan, was still alive in the 1380s. A third possibility comes from closer to Fenne. Albreda’s husband was not the first Rochford to be based in Lincolnshire: the Pipe Rolls record that from 1175 to 1182 Robert de Rochford of Lincolnshire owed the exchequer 4s 8d for some minor misdemeanor. Around this time Robert granted some property in the village of Stainby, 25 miles west of Boston, to Lincoln Cathedral for the souls of his ancestors. Frustratingly he did not say what their names were, but perhaps he was also a younger brother of one of the Guy de Rochfords of Essex. Between 1178 and 1197 a Robert de Rochford witnessed two charters for Beatrice de Mandeville to Walden Abbey, one of them confirming her family’s earlier gift of Elsenham church to the abbey. This Robert was definitely related to the Rochfords of Essex – Beatrice was the mother of Geoffrey de Say, whose charter granting the very same gift to the abbey the elder Guy had witnessed in 1177. It may be that these two Roberts were the same person. It is not known what happened to Robert of Stainby or his family: there are no other known records of the family name in connection with the village until 1271, when Matilda daughter of Robert de Rochford of Stainby paid a mark to have a court case heard. The dates suggest that this Robert was from a later generation, but perhaps Albreda’s husband was the elder Robert’s son. So the available evidence points to at least three people who might have been Waleran’s father: the younger Guy de Rochford of Essex, Simon de Rochford of Wold Newton, or Robert de Rochford of Stainby. But it is all very circumstantial, and it may be that none of these is correct. The missing link is that there are absolutely no known records of Waleran in connection with any other Rochfords, or even with any potential relatives, to help establish who his family were. Perhaps Waleran was the black sheep of the family. In any case, by 1202 Waleran and Albreda’s legal troubles had settled down and it would be several years before they found themselves fighting another case, in the Curia Regis at least. They could get on with organizing their estates. From the early 1200s government records begin to reveal a little more about what Albreda’s inheritance looked like, especially the portion that fell under the honour of Richmond. Prince Geoffrey had died in 1186 – perhaps trampled under a horse at a tournament in Paris – and with this began a chequered period in the control of the honour. Constance was forcibly remarried to Ranulf de Blondeville, the earl of Chester, but within a decade she had the marriage annulled and wed once more to the Occitan noble Guy of Thouars. Then when Constance died in September 1201, her heir as duke of Brittany and earl of Richmond was her fourteen-year-old eldest son with Prince Geoffrey, Arthur. This young prince was also a potential heir to throne of England and a great empire that stretched from Scotland to the Pyrenees. But Geoffrey’s younger brother, John, who had taken the throne for himself, had him captured, imprisoned and killed in 1203. John took the honour of Richmond into his own hands and began a programme of portioning it out to win and reward loyalty, while keeping portions to fill his own ravening coffers. Meanwhile, the empire began to crumble. It must have been hard for Waleran, Albreda and their neighbours to know who they were supposed to be loyal to. From King John’s point of view, it was simple: himself. He was a control freak, a master of law and taxation, and he crisscrossed the country often hearing and deciding on legal cases of all kinds himself. Some of Waleran and Albreda’s legal battles over the last few years must have gone before the king. In late 1200 John levied an on-the-spot tallage or land tax on the men of the honour of Richmond, for which Waleran was to pay 11s 4d for some property he had in Skirbeck. This type of tax was targeted not at land held in return for knight service, but at land held in socage, essentially for an annual rent payment. This brought in to its wide net not only wealthy men who had merchants’ tenements in Boston and elsewhere, but also many free and bonded peasants with rural plots. Later records speak of a carucate of land that Waleran’s successors held in socage Skirbeck for several hundred years – the property he was taxed on here is probably it. Several charters of the early 1200s make mention of property that Waleran had in Boston too, but this was presumably the two plots he and Albreda acquired on settling their dispute with the sisters Ismenia, Ceciliaand Isabella in 1202. These were on the east side of the river near the market, and stretched as far as Barditch, the eastern wall and dyke around the town. Waleran’s immediate neighbours here included Thomas of Moulton, the Huntingfields, Eudo son of Sigar and Reginald Cote, all of whom he witnessed charters for and with. In 1205 John levied another tax, a scutage, for which Waleran was to pay one mark for a quarter and a tenth part of a knight’s fee that he held under the honour of Richmond. This was different property to the land Waleran was taxed for in 1200: a scutage was aimed squarely at land held for knight service. Its lord could pay up, or join the king at war. Only a year before John had lost the duchy of Normandy to the French, and this scutage was intended to finance a rebuttal campaign in Poitou. The English Barons showed little enthusiasm for the project and John had to abandon it, but he demanded the money anyway. Several other records tell us a little more about these two fractions of knights fees that Waleran had under the honour of Richmond. His quarter knight’s fee was missed in a feudal survey of the honour carried out in 1210-1211, but it was correctly recorded in surveys of 1212 and 1218. Both of these note that it was in Skirbeck and Fenne, and that Andrew de Edlington and Robert son of Stephen had some interest in it too. It is not known what this interest was, and it was never referred to in future records. In 1202 Waleran consented to an agreement over some land in Fenne between Baldric the shepherd, Alice his wife, Sigga her sister and Thomas son of Walter – the court remarked that Waleran was present as the “chief lord” of this property. They must have been his tenants on this quarter knight’s fee, where he could indeed be considered to be the chief lord if the king was holding on to this part of the honour of Richmond for himself. Waleran’s tenth part of a knight’s fee, meanwhile, appeared in both the 1210-1211 and 1212 surveys. There is an oddity about it that enables us to pinpoint its exact location: it was described as being in Skirbeck, yet in Kirton wapentake rather than Skirbeck wapentake. This is the place now called Skirbeck Quarter, which is on the southwest side of Boston across the Haven from the old Skirbeck settlement. These surveys only tell us what Waleran and Albreda held directly under the honour of Richmond, and there is good reason to believe they had far more property. Probably quite soon after the couple succeeded to her father’s estates, the abbot of Kirkstead sought Waleran’s confirmation of the grants her father had made to the abbey. Sadly only a very brief index of Waleran’s charters to the abbey survives in the cartulary – the full transcriptions are missing. But there is enough to gather that he gave the monks at least five or six charters confirming Ralph’s gifts, and he may have added some gifts of his own. The Craons and the Huntingfields also gave the abbey much property in Scrane, and from later records it seems likely that the lands Waleran and Albreda inherited from her father there were held under these families. In the early 1200s Roger of Huntingfield and Waleran confirmed the 25-acre swap that Roger and Ralph had made the last century, and they swapped a further five acres each, enabling Waleran to consolidate his holdings in Fenne. They also confirmed all exchanges that their men had made between them. Waleran and Albreda also still had their land at Clipston in Nottinghamshire. In 1207 Waleran was back in the Curia Regis to sue Ralph Barry, who was probably from the neighbouring village of Tollerton, over about thirty acres of land at Clipston. Barry failed to appear for at least three court dates and by summer the next year the fed-up justices had handed a victory-by-default to Waleran and Albreda. Waleran probably spent much time improving and organising his estates just as his father-in-law had, most evidently at Scrane. The chapel at Fenne is often said to have been founded by a William de Rochford in the 1200s. There is no known member of the family by that name who might have had the resources to undertake such a project – it is probably an error for Waleran. We know that there was already a chapel at Fenne in his father-in-law’s time, and later family members had the right to appoint the parson, so there is good reason to believe that Ralph, his father Alan or another predecessor had founded it. But it was probably a very basic construction, possibly even wooden. Perhaps Waleran arranged for a new, more permanent stone edifice to be built in its place for his family’s greater glory and his tenants’ greater loyalty. The relative peace of this period enabled Waleran and Albreda to focus on family too. 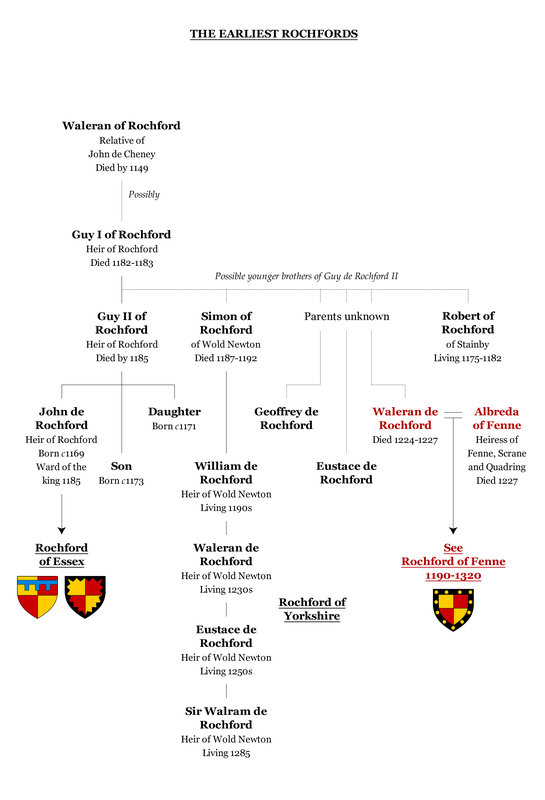 Their son and heir, Ralph de Rochford, was born between about 1204 and 1207. Waleran also had two other sons, Robert and Thomas, but it is not known whether Albreda was their mother. From late 1207 Waleran began to serve as an elector and a jury knight for grand assize cases at the Curia Regis. These were cases over who had the greater right to a certain property, and the law specified that only men of knightly status could serve in them, except in rare cases where not enough knights from the relevant county could be found who had no affinity to either party. Waleran’s first official role in the Curia Regis was in the autumn of 1207, when he served as a knight-elector to appoint a jury of twelve other Lincolnshire knights to hear a grand assize between Robert of Bicker and the wonderfully-named Picot son of Ernew. One of Waleran’s three co-electors failed to appear, however, and the case was postponed until Easter the next year, when Waleran returned to the court to complete the task. In late 1211 Waleran was himself elected as one of twelve knights to hear a grand assize between William de Colville and the Yorkshire baron Maurice de Gant over who had the greater right to knight’s fee at Swinstead. And in the summer of 1212 Waleran was elected for the first time to hear a Nottinghamshire grand assize – this case was between Robert son of Almar and Simon de Kyme over half a knight’s fee in Bilborough. Waleran as not able to avoid war altogether. In the summer of 1210 King John had mounted a massive expedition to Ireland – an armada of some 700 ships was required to transport his army and all that it needed. Waleran managed to avoid this expedition, but only by paying an astonishingly high fine of twelve marks to the king’s exchequer – he managed to clear the debt by late 1211. But by 1213 King John, now wealthy beyond belief having taxed his subjects to the hilt, was planning a new expedition to Poitou to recover his continental possessions. This, Waleran would be involved in. The exchequer lent him 12 marks to cover his costs for the campaign. John’s army landed at La Rochelle in February 1214, while his half-brother William Longespée went via Flanders to secure allies. After several months maneuvering for advantage, on 27 July Longespée’s contingent were routed by the French at Bouvines. John’s grand project was dead in the water. He sued for peace – it was said that the French King Philip II demanded 60,000 marks – and returned to England in October. The campaign had been a complete failure and ruinously expensive. The English king’s coffers were empty. Within months England was on the brink of civil war. John’s tyrannical rule had won more enemies than allies at home, and his unmitigated disaster in France was the final straw: his barons rose up against him. On 17 May 1215 the rebels occupied London and on 15 June, in a meadow named Runnymede by the Thames near Windsor, they forced the king to sign a charter of 63 clauses aimed at curtailing his despotic ways. This was Magna Carta. A few days later 25 surety barons were elected to ensure the king’s compliance – William de Huntingfield was one of them – and the rebels renewed their oaths of homage and loyalty to the king. But John was not one to compromise with his subjects. Less than two months later he secured an annulment of the charter’s terms from Pope Innocent III, and the First Barons’ War broke out. Waleran sided with the rebels, as did many of his closest associates: William de Huntingfield and Oliver de Vallibus or Vaux, who was married to Petronilla de Craon, the heiress of the Craon fee; John son of Jordan, Eudo son of Sigar, Robert de Curcun and Ralph son of Stephen, all of whom witnessed many Huntingfield charters; and Conan son of Ellis, William de Holbeach and Lambert de Oiry. Conan was a major landholder of the honour of Richmond with a base at Holbeach about fourteen miles south of Boston. He, William de Holbeach, Lambert de Oiry and Ismenia of Whaplode were all related, and Albreda was possibly related to them too. Some of these were men Waleran had elected as jury knights for grand assizes, and many were men he had worked with when he was a jury knight himself. All their lands were confiscated. On 4 March 1216 King John issued letters of safe conduct for Waleran and his associates to enable peace negotiations, and on 22 April the king demanded that Waleran hand over his son Robert as a hostage and owe a fine of twenty marks. On receipt of the hostage the king’s representative William Talbot was to return Waleran’s seized lands without delay, and to inform the sheriffs of Nottinghamshire and Somerset that they should do the same. Talbot must have seized Waleran and Albreda’s Lincolnshire lands, and the sheriff of Nottinghamshire their estate at Clipston. It is not certain what property of theirs the sheriff of Somerset had seized, but a later record suggests their heir, Ralph, had a quarter of a knight’s fee at Langford in that county in 1226, so it may be that Waleran and Albreda had it in their time. Meanwhile, similar demands were placed on Lambert de Oiry, who had to hand over his son John and owe ten marks; and William de Holbeach, whose son William doubled up as a hostage for Conan son of Ellis. William de Holbeach’s fine was thirty marks and Conan’s was sixty. This cannot have been good news for Waleran and his companions. King John’s reputation in hostage care was poor to say the least – many had died in his care. Six days later, on 28 April, Waleran had still not handed over his son Robert: King John pointedly handed Waleran’s right to nominate a new parson at Clipston church to two other men, complaining that he “is with the enemies of the king”. A month later, on 21 May, Prince Louis of France invaded England on the invitation of the rebel barons. He was quickly proclaimed king in London. In mid-September King John headed north to separate the rebel-held areas of Lincolnshire and East Anglia, arriving at Lincoln on 22 September (where, remarkably, he confirmed the widow Lady Nichola de la Haye as castellan of Lincoln Castle) and then Boston on 5 October. From here John headed fifteen miles southwest to Spalding and then, a few days later, 25 miles west to King’s Lynn, where he is said to have contracted dysentery. After a few days John departed for Newark on Trent, taking the long route around the fenlands of The Wash via Wisbech, Swineshead and Sleaford, where his sickness took hold. Meanwhile the royal baggage train had taken the direct route through the fens, where the crown jewels were lost in a tidal estuary. Perhaps it is no coincidence that this route passed through Holbeach, where the king can only have been deeply unpopular. 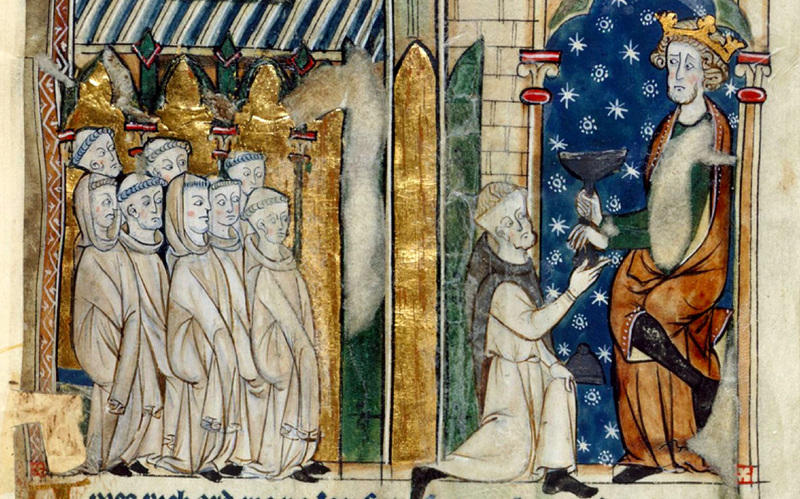 A monk offering King John a poisoned chalice in 1216. Waleran de Rochford and many of his neighbours joined the rebels in the First Baron’s War. The king retaliated by confiscating their lands and demanding their sons as hostages. He died suddenly while travelling in the area later that year, and it was rumoured that the monks of nearby Swineshead Abbey had something to do with it. (BL Cotton MS Vitellius A XIII). John reached Newark Castle on 16 October and died there on the night of the eighteenth or nineteenth. Given that he was travelling through the land of rebels like Waleran whose sons he held hostage, it is impossible not to consider whether foul play was involved. At the time it was rumoured that a monk at Swineshead Abbey had given the hated king a poisoned chalice. John’s nine-year-old son and heir was quickly crowned King Henry III at Gloucester, where royalists still held sway. The famous knight William Marshal, earl of Pembroke, was appointed as protector, and he set about quelling the rebellion and driving out the forces of Louis of France. The turning point came on 20 May 1217 at Lincoln, where the forces of Louis’ captain had taken the town with the aid of rebel English barons, including William de Huntingfield. It is likely that Waleran and his neighbours were with them, although there is no record to confirm it. Marshall arrived to find them besieging Nichola de la Haye, who was holding out in her castle. The French and the rebels were routed. Many, including Thomas, count of Perche, were killed. Huntingfield and other rebel barons were captured. The citizens and clergy of Lincoln were accused of conniving with the enemy and the city was looted – the royalists took so much booty that the battle was nicknamed Lincoln Fair. Over the following months Marshall was able to inflict further defeats on Prince Louis, win rebels over to backing the new young king, and gradually secure peace. After the oppression and complete breakdown of King John’s reign, this fragile new regime needed to quickly demonstrate authority and fair justice – and to raise funds. In early 1218 royal justices in eyre were dispatched to travel throughout England hearing cases, “for the peace of the king and the kingdom, to give justice to each and everyone, poor as well rich” – so the Lincolnshire justices wrote. The last time Waleran had been called to the Curia Regis as a knight was in 1212, but he played an active role in this eyre court while it heard cases in his home county in 1218 and 1219. Then in 1222 he was elected a jury knight to a grand assize at the Curia Regis again for the first time in ten years, to hear a case between Ralph de Cromwell and Ivo de Heriz over some property in Nottinghamshire. And late the next year Waleran was elected once more, this time to hear a case between Vaudey Abbey and Thomas de Reyneville over some land in Lincolnshire. The debts of Waleran and his rebel companions were not written off, however. The Pipe Rolls record that in 1219 he, Lambert de Oiry, William de Holbeach and Conan son of Ellis still owed the full amounts demanded for “having the grace of King John” in 1216. Repayments towards these were still being made to William Talbot in 1224, although in 1227 Talbot would get into a squabble with the exchequer over whether he had forwarded payments on as he was supposed to. Waleran seems to have been less inclined to repay the twelve marks the exchequer lent him in 1214 for John’s disastrous campaign in France – he still owed the full sum in 1224. The last known records of Waleran alive are in connection with his debts to the crown that year, and he was dead by early 1227. He was probably in his mid-to-late fifties when he died. Around Easter 1227 Albreda, now a widow, went to court to sue for her dower or “widow’s portion” of a plot of land. Her case was against Thomas Burnell, who had encroached on three acres of meadow in Quadring that Albreda considered to be her right. She said in court that Burnell had no right in the property, unless through some agreement with “Thomas, the son of Waleran, formerly her husband”. This is the only known reference to Thomas, and it is not at all clear whether Albreda was his mother. It is also the last record of the family in connection with Quadring. But Albreda won her case – Burnell made some default before the justices that he could not rectify, and the property was duly returned to the widow. Albreda died within a few months, however. The Fine Rolls record that on 14 July 1227 the sheriffs of Lincolnshire and Nottinghamshire were instructed “to take into the king’s hand the land formerly of Albrea daughter of Ralph de la Fenne in his bailiwick, which she held of the count of Brittany, and to keep it safely until the king orders otherwise”. This count of Brittany was Peter Mauclerc, who had married Alix, the daughter and heiress of Guy of Thouars and Constance of Brittany. But the English crown now retained parts of the honour of Richmond for its own use, and King Henry would require Albreda’s heir, Ralph de Rochford, to come and pay him homage before allowing him his inheritance.